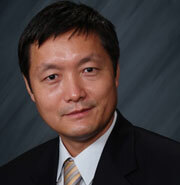 Dr. Lin is currently an Associate Professor in the Department of Mechanical and Material Engineering at FIU. He directs the Computational Fluids and Energy Sciences (CFES) Laboratory and the Sustainable Energy and Thermal Transport Systems (SETTS) Laboratory. His previous positions include Associate Professor and Associate Director in UT CFD Lab at the University of Tennessee, Knoxville, Summer Faculty Fellow in Air Force Research Laboratory at WPAFB, and Program Manager in the Applied Research Center at Florida International University. He earned his Ph.D. in Mechanical Engineering, and has authored and co-authored over 200 papers in peer-reviewed journals and conference proceedings. His current research interests include Computational Fluid Dynamics, Heat Transfer, Microfluidics and Energy Simulations, with applications in HVAC, Indoor Environment, Buildings and Data Centers, Power Plants, Electronic Cooling, Solar and Geothermal Energy Utilization. His projects have been funded by government agencies, including the National Science Foundation, the Department of Energy, the Department of Defense (AFOSR, ONR), and commercial companies, including Pratt & Whitney and ASHRAE. He serves on the review panels of NSF, DOE, and DoD, and on the editorial boards of eight international journals. He is an active member of the ASME, ASHRAE, AIAA, and ASEE. Among his recent awards and honors is the Outstanding Reviewer Award by ASME in 2011. Outstanding Reviewer Award, Heat Transfer Division, ASME, 2011. ASEE-Air Force Summer Faculty Fellowship, Air Force Research Laboratory, Wright-Paterson Air Force Base, OH, 2007 and 2008. Program Development Award, Hemispheric Center for Environmental Technology (HCET), Florida International University, Miami, FL, 2000. Employee Service Award, 5 years and 10 years, Florida International University, Miami, FL, 2000 and 2006. Certificate of Recognition, Florida Georgia Louis Stokes Alliance for Minority Participation (FGLSAMP), 1999. Listed in Who’s Who in Science and Engineering, 1998-present; Who’s Who in America, 2007-present; Who’s Who in the World, 2008-present. Award of Excellent Academic Paper for Young Scientists (AEAP), Institute of Engineering Thermophysics, Chinese Academy of Sciences, 1993. Research conducted in the CFES Lab is focused on computational fluid dynamics fundamentals and applications (turbulence, multiphase flows, and combustion), building energy simulation, reduced order modeling, and indoor environmental modeling. Research conducted in the SETTS Lab includes compact heat exchangers, thermal management, microfluidics, HVAC, solar energy technologies (including PV/T), and geothermal energy utilization using ground source heat pump. The solar powered building, out of the U.S. Solar Decathlon 2005, is currently a live facility for renewable energy technology demonstration, building performance monitoring, as well as a venue for student education and outreach activities, in collaboration with other faculty and staff in the College of Engineering and Computing. Soheil Soleimanikutanaei, Cheng-Xian Lin, Dexin Wang, Numerical Modeling and Analysis of Transport Membrane Condensers for Waste Heat and Water Recovery from Flue Gas, Int. J. Thermal Sciences, Vol. 136, pp. 96-106, 2019. Soheil Soleimanikutanaei, Esmaiil Ghasemisahebi, Cheng-Xian Lin, Numerical Study of Heat Transfer Enhancement using Transverse Microchannels in a Heat Sink, Int. J. Thermal Sciences, Vol. 125, pp. 89-100, 2018. E. Ghasemi, H. Bararnia, Soheil Soleimanikutanaei, C.X. Lin, Direct Numerical Simulation and Analytical Modeling of Electrically Induced Multiphase Flow, International Journal of Mechanical Sciences, Vol. 142-143, pp. 397-406, 2018. Carlos Ulloa, Jose M. Nunez, Chengxian Lin, Guillermo Rey, AHP-based Design Method of a Lightweight. Portable and Flexible Air-Based PV-T module for UAV Shelter Hangars, Renewable Energy, Vol. 123, pp. 767-780, 2018. L. Phan, C.X. Lin, Reduced Order Modeling of a Data Center Model with Multi-Parameters, Energy and Buildings, Vol. 136, pp. 86-99, 2017. P. Shinde, C.X. Lin, A Heat Transfer and Friction Factor Correlation for Low Air-Side Reynolds Number Applications of Compact Heat Exchangers (1535-RP), Science and Technology for the Built Environment, Vol. 23, pp. 192-210, 2017. R. Kiflemariam, C.X. Lin, Experimental Investigation on Heat Driven Self-Cooling Application Based on Thermoelectric System, International Journal of Thermal Sciences, Vol. 109, pp.309-322, 2016. S.R. Reddy, M.A. Ebadian, C.X. Lin, A Review of PV-T Systems: Thermal Management and Efficiency with Single Phase Cooling, Int. J. Heat Mass Transfer, Vol. 91, pp. 861-871, 2015. J. Wagner, M. Schafer, A. Schluter, L. Harsch, J. Hesselbach, C.X. Lin, Reducing Energy Demand in Production Environment Requiring Refrigeration – A Localized Climatisation Approach, HVAC&R Research, Vol. 20, No. 6, pp. 628-642, 2014. L. Phan, C.X. Lin, A Multi-zone Building Energy Simulation of a Data Center Model with Hot and Cold Aisles, Energy and Buildings, Vol. 77, pp. 364-376, 2014. E. Ghasemi, S. Soleimani, and C.X. Lin, RANS Simulation of Methane-Air Burner Using Local Extinction Approach within Eddy Dissipation Concept by OpenFOAM, Int. Comm. Heat Mass Transfer, Vol. 54, pp. 96-102, 2014. E. Ghasemi, S. Soleimani, and C.X. Lin, Secondary Reactions of Turbulent Reacting Flows over a Film-Cooled Surface, Int. Comm. Heat Mass Transfer, Vol. 55, pp. 93-101, 2014. M. Schafer, R. Detzer, J. Hesselbach, S. Bohm, P. Shinde, and C.X. Lin, CO2 and Thermal Gradient Based Demand-driven Stratified Ventilation-Experimental and Simulation Study, HVAC&R Research, Vol. 19, No. 6, pp. 676-692, 2013. X. Wang, X. Wang, G. Xing, and C.X. Lin, Maximizing the Detection Probability of Overheating Server Components with Sensor Placement Based on Thermal Dynamics, Sustainable Computing: Informatics and Systems, Vol. 3, No. 3, pp. 148-160, 2013. Chair, K-19 Environmental Heat Transfer, HTD, ASME, 2013-2016. Chair, Research Subcommittee, TC 4.10 Indoor Environmental Modeling, ASHRAE, 2015 – present. Chair, Membership Subcommittee, TC 4.10 Indoor Environmental Modeling, ASHRAE, 2013 – 2015. Associate Editor, Heat Transfer Research, 2003 – present. Guest/Associate Editor, ASME Journal of Thermal Science and Engineering Applications, 2018-present. Associate Editor, International Journal of Engineering, 2009-present. Editorial Board Member, International Journal on Heat and Mass Transfer – Theory and Applications, 2003 – present. Editorial Board Member, Advances in Mechanical Engineering, 2008-present. Editorial Board Member, Journal of Combustion, 2012-present. Editorial Board Member, Journal of Renewable Energy, 2012-present. Honorary Editorial Board Member, Advances in Theoretical and Applied Mechanics, 2013-2016. Committee Member, University Graduate Council, Florida International University, 2013-2015. Committee Member, ABET Committee, Department of Mechanical and Material Engineering, Florida International University, 2012-present. Committee Member, Strategic Planning Committee, Department of Mechanical and Material Engineering, Florida International University, 2011-present. Faculty Advisor, ASHRAE FIU Student Branch, 2012-present.